We assess your dog’s behaviour in conjunction with its overall living environment. This includes interactions with family members, the home setting and surroundings, and any owner-related issues that may influence and/or cause the unwanted behaviour. Once a behavioural issue is identified, specific scenarios are developed in which both the dog and the family members can address the issue through the use of role playing. During the role play sessions, the dog and the family work together, under the direction and supervision of the training instructor, to demonstrate/teach the dog that the unwanted behaviour is not acceptable in a given situation or situations. This is further reinforced by praising the dog when the correct behaviour is exhibited. Owner/family involvement is the key to correcting behaviour issues. 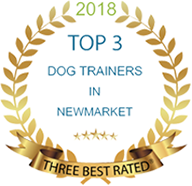 It is a cornerstone in the collaborative effort between the dog, its owner(s), and the trainer to teach the dog how to react appropriately to different situations within its overall environment. It is also incumbent upon the owner(s) to create a positive, stress-free atmosphere for the dog so that unwanted behaviour can be averted.